First of all – what is tumbling? Tumbling is a form of gymnastics that does not require any form of equipment or props! It is a performance of acrobatic movements such as rolls, twists, somersaults, and even handsprings, all on floor mats with no help. Students can even learn to do flips and jumps after some time. Tumbling is an awesome way to get your child moving to build their strength and stamina. The practice of tumbling goes all the way back to to ancient China, Greece, and Egypt; it was performed by traveling bands of entertainers in the Middle Ages! Tumbling has a lot of amazing effects on a student. It is one of the best forms of exercise for kids, improving their bone strength, their stamina, and their overall cognitive functioning that is so crucial for the younger age groups. Kids that are in tumbling live a healthier life and turn into healthy adults. Today, we are going to go over some positive effects of taking a tumbling class here at Omaha School of Music and Dance! Let’s get rolling! Tumbling is a wonderful way to enhance your child’s motor skills. Doing acrobatics like tumbling improves performance both physically and mentally which improves the body’s general motor skills. This is great for your child’s mobility and their posture! Learning this complex skill so early in a child’s life enhances their learning skills and their physical response times! While helping their physical strength, tumbling can also majorly improve your child’s flexibility which can follow them into their adulthood. Because tumbling requires specific types of stunts and movements, your child will learn great flexibility and balance! Flexibility is very important for children to learn as it prevents them for injuring their muscles and joints when they are playing or participating in sports. Starting at an early age can even promote more flexibility in your child as well as stronger ligaments, joints, and tendons, which can prevent any growth defects and prevents fatigue later on in life when they are participating in more activities. Depending on your child’s flexibility, this can determine the range of stunts they can perform in tumbling! At a maximum functioning level of flexibility, they can perform splits, leaps, kicks and sidekicks! 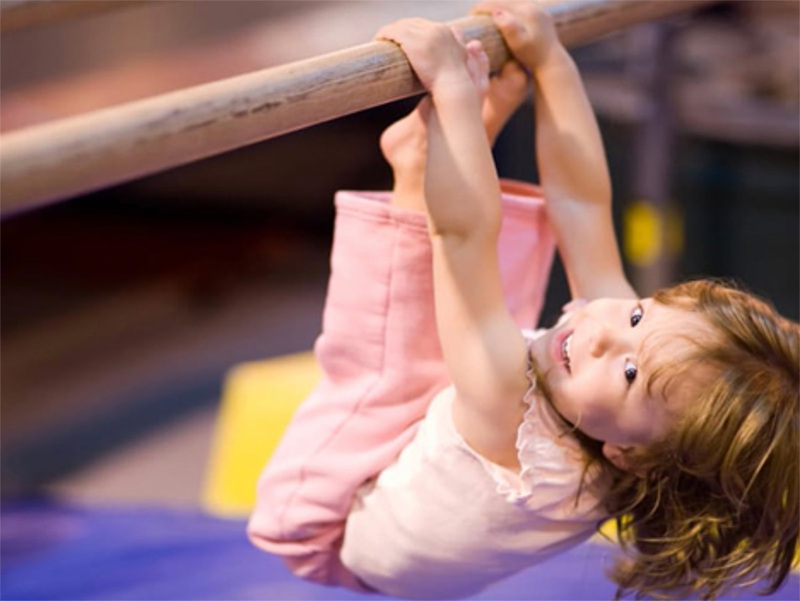 Tumbling can help improve balance for children as well! This proper coordination will improve overall motor skills and general stability. This is so important for a child to learn in their early years! Tumbling is also a great way to teach your child some basic social skills like patience, responsibility, cooperation, discipline, and many more! Tumbling is a great way to get children to learn to follow directions while also having some fun in the meantime. Going through the motions of the obstacle course is much more than just a tumbling lesson! While children wait for their turn on the trampoline or on the tumbling mats, this teaches them patience while also helping them contain their excitement! This also teaches them safety skills and keeps them listening to the teacher at all times. Moving mats and working with partners and their teachers keeps your children cooperating with each other while in their tumbling class! These social skills are imperative for you child’s growth in both school and in their tumbling or gymnastic life! Learning all these wonderful tumbling skills are just the start of all the lessons you can learn here at Omaha School of Music and Dance. Tumbling is a fun and interactive way to get your child interested in a bunch different of classes! We offer tumbling classes for children ages 3-10 as well as for many other classes they can start with such as dance, group music classes, and private classes! Sign up today on our website or in person! We are located on 144th and Dodge or you can call to set up a tour today by calling us at 402-515-9639! We are so excited to see your little ones grow with us in our tumbling classes! We can’t wait to see these benefits show in your child! OSMD is a great place to start for music or dance and we are so excited to help you reach your goals!